This weekend is the Victoria Day long weekend, and in our neck of the woods that means it’s the unofficial start of summer. 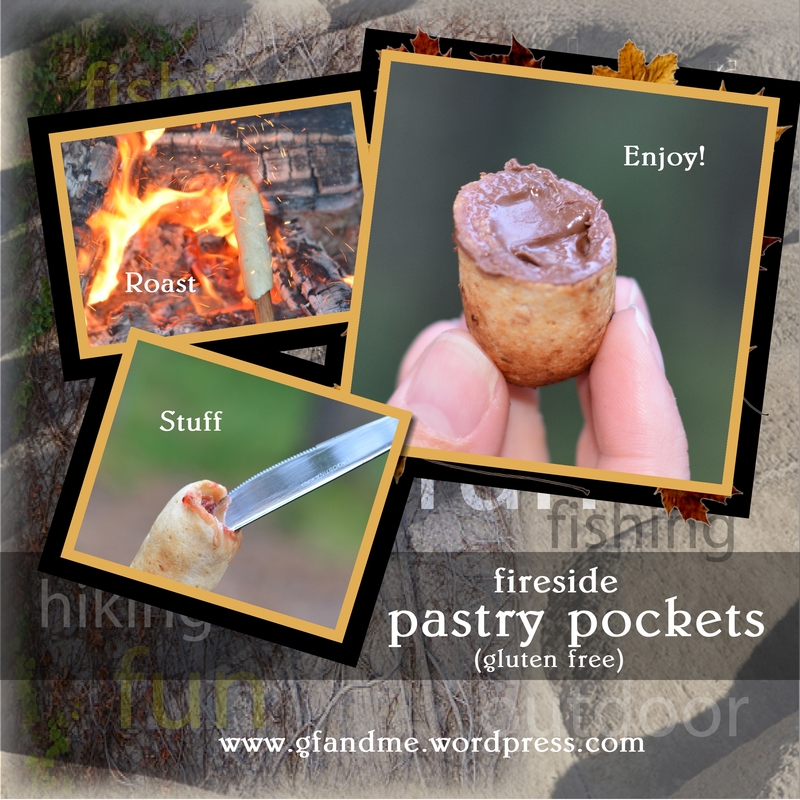 In honor of the season, we decided to post one of our best gluten free camping recipes. If you’re out camping, having a Bar-B-Que or just spending an evening by the fire or even beside the fireplace (it is Canada after all!) give these pastry pockets a try – you won’t be disappointed! Cooked on a wooden dowel (purchased at any hardware store), they can be stuffed with an endless assortment of goodies. Try peanut butter and jam (Geoff’s favorite), Nutella (my favorite), our not-too-sweet cream cheese icing and a sprinkling of cinnamon (tastes like a cinnamon bun – fantastic! ), and fruit flavoured yogurt (more healthful and still very tasty). TIP: round the edges on the cooking end and sand the doweling to avoid slivers and for easier removal of the pastry. Combine the cottage cheese, milk/buttermilk, sugar, melted butter, and vanilla in food processor. Process until smooth (about 10 seconds). To make a pastry pocket, grease the end of your dowel with butter or margarine. Tip: Uses a plastic glove for this and for working the dough onto the doweling. This keeps your hands clean and has the added benefit of layering some of the butter onto the dough so it browns better. Remove a large pinch of dough – enough to roll into about a 1 inch ball. Work the dough over the end and up the sides of the dowel so that you have a finger-length pocket. Roast the pocket over hot coals, turning until it browns nicely. You’ll know it’s finished baking when it releases easily from the dowel. Remove from the dowel and let sit for a bit to finish baking and to cool. Then … let the stuffing begin! This entry was posted in Baking, Drinks & Desserts, Recipes and tagged BBQ, coconut flour, gluten free, nutella, outdoor recipes, vegetarian. Bookmark the permalink. How fascinating. This is ingenious. Did y’all come up with this technique? No. The technique came from friends of ours that do something similar with Pilsbury crescent roll dough. We wanted to see if we could put together a gluten free version!